The heavy rain during the day had many roads of the city waterlogged today. The concept of “Mitr Police” as publicised by the Uttarakhand Police Department seems to be fitting perfectly in Haridwar as the state police personnel don the duty as the Kanwar police or mela police. Though the state police has been embroiled in controversies, in the Kanwar season so far the state police behaviour and its friendly attitude has evoked praise. A leopard has been sighted inside Indian Military Academy (IMA) campus here. Now, visually challenged clients too will be able to withdraw cash from an ATM. 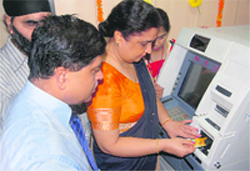 Designed keeping in mind their unique needs, the ATM, set up by Punjab National Bank (PNB), was inaugurated at the National Institute for the Visually Handicapped (NIVH) today. Continuing with its campaign against commercial establishment found flouting Mussoorie Dehradun Development Authority’s (MDDA) norms, a team of officials today sealed Vishal Mega Mart on the Rajpur Road. The atmosphere at the city’s premier college Shravannath Math Jawaharlal Nehru College (SMJN) is quite tense these days with both major students’ outfits - the Akhil Bharatiya Vidyarthi Parishad (ABVP) and National Student Union of India (NSUI) - at loggerheads over the closure of the college on the admission quota issue. The ICFAI University’s Faculty of Education bade au revoir to its 4th batch of students at an emotionally charged farewell organised at the College auditorium here today. 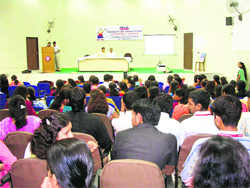 The farewell function for BEd students in progress at ICFAI University in Dehradun on Friday. Acting on the direction and vision of national in charge, National Students Union of India (NSUI) and Youth Congress (YC), Rahul Gandhi, who has set out to achieve the mission of ending the nomination culture and putting in place a democratic process to elect office-bearers all over the country, a press conference was held in a hotel at Mussoorie yesterday to explain the intricacies of the whole election process and membership drive being carried out in the Youth Congress in Uttarakhand. A Congress membership form was also launched on the occasion. The district administration is planning to serve notice on those teachers who are not joining duty in the interior areas despite being promoted. “Books leave an indelible impact on the minds of children and help groom their personality,” said Uttarakhand Governor Margaret Alva while inaugurating Ghummakkad Narain - The Travelling Children’s Literature Festival here today. In order to fight global warming and to generate awareness among school students, a month-long awareness drive is being launched by iCARE in the city. More than 5,000 saplings were planted by Himveers and officials of the Indo-Tibetan Border Police (ITBP), in association with the Forest Department at Combat Wing (Stella Estate), under the programme plantation week that began on Wednesday. By scoring two goals Rakesh ensured the 4-0 triumph of City Young against Sunderwala in the Nemi Dass District Super League played on the Pavilion Ground here today. Players vie for the ball at a match of the Nemi Dass District Super League in Dehradun on Friday. SGRR Bindal and SGRR Patelnagar won their respective semifinals today to face each other in the final clash of the SGRR Sahodaya Inter School Tournament to be played tomorrow. A match in the SGRR Sahodaya Inter-School Tournament in progress in Dehradun on Friday. The Uttarakhand Muay Thai Association gave away sports shoes and tracksuits to Muay Thai national players of the state at the Kanwali GMS Road situated training centre. Uttarakhand Muai Thai players being given tracksuits at a function in Dehradun on Friday. Heavy rain disrupted normal life in the state capital today. The rain started at about 10 am and continued incessantly till evening. The roads got water logged leading to traffic jams on the major junctions of the city. It took about one and a half hours to normalise traffic near Heritage School. The situation became more pathetic when students left from their respective schools after the schools got over. People spent hours on roads to reach their destinations due to the jams. “Normally, I reach home from school in 15 minutes but it took me about an hour today,” said Daksh, a school student. Some of the nullhas got choked which created problems for people. There were reports of rainwater getting into the houses of the residents. Normal supply of water and electricity also got affected in some of the parts of the region. Some of the areas include Dharampur, Patelnagar, Kanwali Road, EC Road and Patelnagar affected badly. 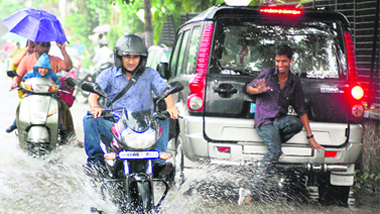 The heavy rain during the day had many roads of the city waterlogged today. Especially areas such as Indira Gandhi Road, Survey Chowk, Income-tax Road, Subhash Road, Sahastardhara Road and Kishan Nagar Road remained submerged. A group of shopkeepers complained to Mayor Vinod Chamoli that they had to close their shops as the water from roads flowed into their shops. Around 160 shops of the area were closed given to the situation. “The thick mis-mash of wires on roads and the faulty drainage is responsible for the crisis in our area,” said a shopkeeper. The Mayor assured them of quick action in the matter. Chamoli also visited the problematic areas of the city during the day. “I found the cross drain of the Indira market dysfunctional, water flowing around MKP College and on the Subhash Road due to shopping complex clogging the water level. Action will be taken in all these cases”. Deployed on the entire Kanwar route at all major intersections of the district, the police personnel are acting as friends and guides too to the millions of Kanwariyas thronging the pilgrim city to fetch the holy Ganga water as part of their yatra. Outside the district, the police personnel are finding the Kanwar duty as an experience in itself, many relating it with the Maha Kumbh duty too. Circle Officer, Mussoorie, Shweta Chaubey overseeing the Kanwar proceedings at the Singh Dwar, Prem Nagar Ashram stretch, one of the vital Kanwar yatra stretch, opines the role of the police in the Kanwar duty assumes a different aspect too, that is of being a friendly host in addition to providing security to devotees. “When millions of Kanwariyas from far-off states are coming to the city, it’s our duty that we guide and assist them besides performing our normal duty of providing them security. We have shifted Kanwar shops mostly on the Kanwar stretch so that they don’t have any problems. Besides we guide them to the yatra path and even extend help in case any one is taken ill,” said Chaubey. On the other hand, Kanwariyas too are quite a happy lot with the Uttarakhand police behaviour. The Kanwariyas from Uttar Pradesh, Haryana, Delhi who are mostly used to rough and aggressive nature of police personnel of the respective states, are quite impressed with the host Kanwar Police. To many, the best phase of their journey has begin since they entered Uttarakhand border with the police assisting them at diversions and intersections, informing them about shorter routes, availability of water, toilets and places to stay at night. While the mela police personnel is also stern when any one violates rules, they try it in their friendly way only, and as such Kanwariyas are following the Kanwar patri route only and not hindering highway traffic unnecessarily. Notably, for this Kanwar duty four Assistant Superintendents of Police, 20 Circle Officers, 45 Inspectors, 250 SHOs, 4,000 constables, 100 home guards jawans, two companies each of Rapid Action Force and Provincial Armed Constabulary have been deployed. Besides, bomb disposal squads, mounted police, water police, disaster management squad and intelligence personnel disguised as Kanwariyas have been deployed to ensure a peaceful conduct of the fair, which will conclude on August 8. Considering last year’s turnout of around 7.5 million Kanwariyas, this year it is estimated to touch almost even higher mark. The round-the-clock duty is definitely putting a great pressure on police personnel, but with a friendly smile the Kanwar police is determined to ensure not only the Kanwar mela’s successful completion, but also accolades from Kanwariyas for a friendly gesture. Major Amit Dagar, Public Relations Officer, Indian Military Academy, today said the movement of a fully-grown leopard has been noticed near the south campus of the IMA. The academy has now appealed to the state forest authorities to take note of such incursions and initiate measures so that the movement of beasts into human habitat is restricted. He also recalled a series of attacks on IMA personnel residing in the campus by wild animal last year. “The safety of gentlemen cadets is of prime importance following which regular day and night patrolling is being carried out as the animal has been spotted in broad daylight too. “This has caused considerable fear among civilians and children residing on campus,” Major Dagar pointed out. “Timely action needs to be taken by the Forest Department to relocate the leopard lest it turns into a man-eater,” he added. Forest authorities said that they were looking into the issue and have already installed cages all across the state. A week earlier, leopard movement was seen at the Rashtriya Indian Military College. RIMC authorities too have sought prompt intervention of Dehradun Forest Division officials in caging the beast. Forest officials came across a critically injured female leopard in Belpadav range of Terai West forest division of the state, that falls in periphery of the tiger-famous Jim Corbett National Park. The three-year-old leopardess with injuries on its body was noticed by villagers at Chhoi area of Ramnagar forest division in the afternoon. Prompt treatment was administered to the leopardess but that could not save the wildcat. Ramnagar Terai (W) Divisional Forest Officer PK Patro said despite providing best of treatment, the female leopard could not be saved. He said exact reasons of death could be known after conduct of the post mortem facilities. He, however, added the preliminary examination of the animal has indicated that she might have received the injuries during a fight with another leopard or wild animal. It was also found out that she did not eat anything for the past 10-15 days. A first of its kind initiative in the state, the ATM will be scanning customers with the help of a biometric software allowing them to withdraw cash just as easily. Persons with other disabilities can also use it too. Speaking at the inauguration of the ATM, Director of the NIVH, Anuradha Mohit said it was long over due. “It will give a sense of independence to the visually challenged and being located at the campus it will easily be accessible to them. In fact, banking and other services should be designed keeping in mind the needs of the physically challenged,” said Mohit. VK Srivastav, Chief, Dehradun Division Punjab National Bank, said the software was able to recognise the voice and fingerprints of the customers. The MDDA team, accompanied by a heavy police force, sealed the entire Vishal Mega Mart, a well-known commercial establishment in the city. MDDA sources revealed that the Vishal Mega Mart had approved the map for utilising second and third floors for its offices and residential purposes. But, the mart was instead using these floors for commercial activities. Significantly, employees working with the mart, who number around 92, strongly protest the MDDA’s move alleging that they would be losing their jobs if the mart activities got closed down. But, the heavy presence of police prevented the employees from resorting to any misadventure and the mart was finally sealed. Recently, the MDDA sealed some floors of a commercial establishment, one at the Prince Chowk and another on the Rajpur Road. The MDDA has been going stern against commercial establishments found flouting the MDDA norms. While admission forms are being submitted at the college administrative office these days, the ABVP has been forcing the closure of the college citing the non-fulfilment of their demands by the college management regarding specific admission quota seats for the college students union. The closure by the college union, supported by the ABVP, has also hit the admission process in past few days. SMJN College student union president Shakti Tyagi said that in the admission for various classes, a specific quota for the union should be allocated so that union can allot these seats to those students who are poor but don’t have requisite marks. “Our demands are legitimate, as apart from the quota, we are also seeking an increase in number of seats for BCom as our college is the lone renowned institution that caters to the whole city area. “With insufficient seats, students are either forced to take admission in private colleges that charge huge fees or have to move to nearby areas like Dehradun, Rishikesh, Roorkee to pursue commerce,” said Tyagi. Protesting at the college premises, the students belonging to the outfit warned that they would not allow college proceedings to go on if their demands were not met. On the other hand, the NSUI unit of the college has opposed the indefinite closure of the college by the ABVP-dominated college union. The NSUI has termed the shutting down of college during admission time as unfortunate stating that the present union doesn’t care for the loss of the students. A delegation of the college unit met the Principal urging him to get the college functional again and seek the police’s help if necessary. In a press statement, the members of the unit even charged the college union of inviting anti-social elements to pressurise the college staff and management. Speaking on the occasion Dr DK Giri, Dean Faculty of Education laid stress on the values imbibed throughout the year at the ICFAI during their training. He cued that in an age of materialism, it is very important that the children of tomorrow imbibe the traits of being selfless, disciplined and worthy teachers of the nation. Dr Giri spoke on the objectives of being alumni in curriculum development through continuous feedback and by contributions through different activities. The programme was graced by Pro Vice-Chancellor of the University, Dr SC Deorani who apprised the audience of the importance of being a teacher. He was happy to see the institution grow by leaps and bounds and wished good luck to all those have passed out from the institution. He laid stress on value-based education and the importance of innovative pedagogy to be used by the teachers specially while dealing with special cases. Addressing the gathering the registrar of the University Prof PK Das reminisced his days as a student and commented that the alumni is a true reflection of any institution. 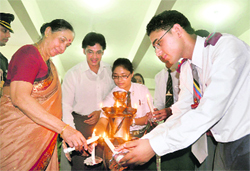 The programme was compered by Tanveer Alam and Anjali Prasad of 2010-11 batch. The students were blessed by Deans of various departments and all the faculty of the Department of Education and were presented with a signed memorabilia at the conclusion. All the pass outs were handed over mementoes by Brig Sabharwal (retd), Dean Faculty of Management Studies, IUD and Col SK Jairath Chief Administrative Officer. Surbhi Jolly Grover (chief librarian) also graced the programme. The vote of thanks was proposed by the Dean, Faculty of Education Dr DK Giri at the conclusion. Congress Tehri Lok Sabha Returning Officers Rajesh Joshi from Gujarat and Kanwarjeet from Chandigarh, speaking to the media, said the former Prime Minister and Congress leader late Rajiv Gandhi 23 years ago had introduced the voting right for the youth at the age of 18 and involving them directly in the political process. Rahul Gandhi, going a step further, has introduced the 18-35 years age limit criterion in the elections of the Youth Congress replacing the nomination process conducted in the past. Joshi elaborating further said the process had begun with a membership drive launched by Youth Congress In charge Bahavan Digambar in Dehradun on Wednesday. Following that the members of gram panchayat/nagar palika parishad ward members will elect municipality committee officials five in number. The member obtaining highest number of votes will be the president and the rest will follow in the descending order. The office-bearers in the nagar nigam will consist of 10 officials. A similar pattern will be followed for the Vidhan Sabha, Lok Sabha and state units. The membership fee will be Rs 15. Joshi said the process would also lead to building a leadership at the grassroots level, starting with colleges and going up to district, state and finally the national level. Earlier, youth leaders were imposed from the top. Now the leadership would be developed and groomed from the bottom to the top. Joshi also informed that the new process had been a success in several states and Uttarakhand would not be an exception. Mussoorie MLA Jot Singh Gunsola, Mussoorie Congress Chief Bhagwan Singh Dhanai, former Palika President Manmohan Singh Mall, Sandeep Sahni, Mussoorie Youth Congress President Shailendar Bisht, Sunil Panwar, Rais Khan, Jagjit Kukreja, Gaurav Garg, Vinayak Rajat Agarwal and others were present on the occasion. Speaking at a block development committee (BDC) meeting at Okhalkanda today, District Development Officer (DDO) AS Gunjayal said that other teachers would be promoted against those not joining their duties. The other issues that came up at the meeting were the demand for a science teacher at Dholigaon Inter College, deployment of teachers and Principal at schools in Malli Pokhri and Putgaon along with the opening of a dispensary at Bhirapani. He asked officials to maintain a register of the problems being aired by public representatives and address them in a time-bound manner. It was also suggested that minor works in the villages be executed under the Mahatma Gandhi National Rural Employment Guarantee Act (MNREGA) as this would also provide employment besides development. The problems raised by the participants mainly pertained to electricity. The gram pradhan of Kapkot village said that the area between Haidakhan and Harishtal has been without power for the past four months. The DDO asked the officials of the Power Department to visit the area and resolve the matter. The gram pradhan from Sui village demanded that the problem of hanging electric wires be addressed at the earliest. Installation of a new transformer at Haidakhan was also sought. The villagers seeking new power connections were asked to apply for the same immediately. The nine-week festival comes as part of the United Nations Educational Scientific and Cultural Organisation’s (UNESCO) Donate the Book initiative and is being organised by NGOs Nivesh and Himalayan Hub for Art and Cultural Heritage (HHACH). The Governor said while books kept much significance for society, it held all the importance for children due to their growing age. She said the festival could not come at more opportune time in the wake of Union Government’s Right to Education Act 2010, which emphasised the existence of libraries complete with books, magazines, newspapers including story books. Elaborating on the Act, Alva said the right to education would ensure better education for those sections of society which were deprived of quality education as the act would facilitate reservation of 25 per cent of seats in public schools for children from poorer sections. Equating the Donate the Book initiative with Toy Bank Scheme, launched by her in Delhi some time back, the Governor said such campaigns revealed the commitment of well-off sections of society towards the underprivileged children. He asked the elite sections to come forward to make Donate the Book campaign a resounding success. Alva minced no words in describing Dehradun and Mussoorie as place full of writers. “Dehradun and Mussoorie are full of writers and I am very hopeful that Dehradun will lead the country in the Donate the Book initiative. Earlier, eminent author Stephen Alter lauded UNESCO’s Donate the Book initiative, stating that it was an opportunity for the children to get the best of reading in the city of Dehradun. He was joined by The Heritage School Principal B Gill, who hoped that schoolchildren from Dehradun and adjoining areas would be extremely benefited from the festival. Shaguna Gahilote, Project Officer for Culture, UNESCO, New Delhi, who compered the proceedings, said eminent personalities like Anushka Ravishankar, Roopa Pai, Mahmood Farooqui and Advaita Kala would be addressing different sessions at the festival. Divided into nine parts according to the nine weeks, The Travelling Children’s Literature Festival will feature two interactions each week, one with a writer and the second with a non-formal writer, storyteller and illustrator in conjunction with a school activity. The interaction will take place both in Mussoorie and Dehradun subsequently. During the week, authors, illustrators and non-formal storytellers will stay with the children and interact with them for a period of two to three days dividing their time between Dehradun and Mussoorie. During these two months, associated inter-school activities like debates, poetry elocution, review of books, enactment of scenes, etc, will take place at the school level. A small two-day special event will be organised towards the culmination of the festival on September 28-29 to showcase the activities undertaken during the festival. “Our inspiration for this festival has been our father Thakur Vishvanarain Singh, who shared his love for books and learning not just with us but with all and sundry. A known journalist and writer in Dehradun, he loved to promote literature among the children”, said Rachna and Prarthna, the Gahilote sisters who represent Nivesh and HHAH, respectively, and have been instrumental in the organisation of the Festival. Director of The Heritage School Vikrant Chowdhary and other eminent writers and authors were part of the gathering. Under Plant for the Future Campaign various programmes are being initiated and conducted covering schools, colleges, government offices and private institutions to plant saplings as much as possible to conserve the environment. Under this campaign Van Mahotsava was organised at Kendriya Vidyalaya situated in BHEL and Dehradun Hills Academy wherein students planted saplings today. Students were apprised of the importance of trees and the direct-indirect affect of these on the environment as well as on human life. A total of 31 species of trees were planted in the school premises, including ashoka, silver oak, bottle brush, phycus panda, kachnar, gulmohur and camphor. The saplings were sponsored by the Aagaas Federation which will be providing saplings for the month-long campaign. Assuring full support to the campaign, Kendriya Vidyalaya Principal Ombir Singh thanked the iCARE members for working towards preserving our nature and generating mass awareness by involving students. Urging students to get involve in this campaign from core of their heart Lavish Bhatia member of the campaign said students are the future of today so if they plant a tree today its benefit will be shared by them only in future and seek suggestions also from the students. Informing about the future events Pooja Bhatt, PR head iCARE, said in August similar programmes will be initiated in schools, colleges, governmental offices of Dehradun involving corporate houses too focusing on having a pool of dedicated citizens who work round the year for environmental causes. They planted various species like oak, devdar and silver oak. The chief guest on the occasion was Palika President OP Uniyal who inaugurated the event by planting a sapling, along with senior officials of the ITBP. Uniyal said soldiers from the ITBP had always taken up challenges, be it guarding the frontiers of the nation or fighting global warming. He further said the ITBP force was a pioneer in all social and environmental works and had provided support to the town wholeheartedly in combating disaster or carrying out cleanliness drive in Mussoorie. He commended the efforts of the jawans in keeping the town green by preserving the fragile ecology of the town. He was also hopeful that the ITBP would continue to contribute in a similar fashion in the future too. Deputy Inspector-General, ITBP (Administration) Devender Singh said the ITBP realised the importance of the forests during their postings in such areas that were bereft of greenery and one small patch of forest enlightened the whole force. He also said the force had clear directions in the event of a forest fire, and that was to act immediately in extinguishing it without waiting for orders. He said forest fires generally occurred during summers and it was the time when birds and other species built their nests. Hence, saving the forest became the utmost duty of the soldier. He informed that the work of the plantation had begun earnestly last week in the campus and would go on till August 3. Singh also highlighted the importance of the survival rate of the planted saplings and commended the force for achieving more than 80 per cent of survival rate in last year’s plantation. He said every jawan had resolved to care for every sapling so that these grew into full-fledged trees. He said the ITBP’s main objective was not only to safeguard Himalayan borders, but also preserve the ecology of the region and this exercise was a step in that direction. Divisional Forest Officer RG Verma also commended the efforts of the force in achieving the target and supporting the cause. Forest Department Sub Divisional Officer Komal Singh sang a few poems related to environment preservation on the occasion. DIG Austen Ippon, DIG (Training), Commandant (Administration), PS Dangwal, Commandant (Training) Ajay Pal Singh and others were present on the occasion. Rakesh scored in the 15th and 25th minutes to put his team score at 2-0 before the end of the first half. Opponents Sunderwala buckled under pressure and couldn’t make even the use of opportunities it got. On the contrast it helped its rival in increasing their score tally as Susant of Sunderwala scored a self-goal in the 55th minute. In the later part of the match, Rahul also found the target in the 80th minute. Jagdish of City Young and Anil of Sunderwala were shown yellow cards during the match. Meanwhile, Doon Star and Sarvodaya are slated to meet in tomorrow’s league match. SGRR Patelnagar easily beat SGRR Bhaniawala 5-0 in the first semifinal match. Just the match started and Udit made full use of the opportunity he got in the 1st minute scoring a nice goal. Later Patelnagar’s Vishal Selwan (20th) and Ankit (27th) netted a goal each before the end of the first half taking the score to 3-0 in their favour. Bhaniawala, which failed to score even a single goal had another shock when team’s player Kamal scored the self goal in 38th minute. Following which Tusar Thapa of the winning team scored the last goal of the side in the 45th minute to end the match on 5-0. While in the second semifinal, SGRR Bindal had to use all its acumen to get past SGRR Balawala 3-2. Satyam (second), Udit (28th) and Albert (37th) scored for the winning team. While goals of Ankit (15th) and Vikas (44th) of Balawala proved futile. A total of 32 players were given away the kits sponsored by the Uttarakhand Sports Department. Members of the association said the state players of Muay Thai had been brining laurels to the state for past two years. The members said this step by the government would encourage the players who were among the best players in the country and they would continue to give good performances in the coming competitions.